San Francisco. The Dominican Republic is the new Baseball World Champion. They hadn't been awarded the title since the 1948 IBAF Baseball World Cup, played in Nicaragua. They defeated (3-0) Puerto Rico in the Championship Game of the 2013 World Baseball Classic and became the third winners of the tournament, succeeding Japan. To complete the Dominican triumph, second baseman Robinson Cano was named the tournament MVP. "Now we celebrate" said Cano in a post game press conference "Thursday we celebrate. Friday we will remember our Spring Training starts over...My award? This is something you couldn't do alone. Our team is the real MVP"
Shortstop Jose Reyes entered the postgame press conference on the phone and announced he had just received a call from the President of the Dominican Republic Danilo Medina: "I just told the President that we won for all of the Dominican People". The Dominican win was as clear as possible. They took a 2-0 lead in the first inning, capitalizing on a shaky start by Giancarlo Alvarado. First baseman Edwin Encarnacion connected for a two-run double and the Dominican Republic never had to look back. "Giancarlo had trouble with his secondary pitches. Too bad, but you have to tip your hat to their hitters" commented Puerto Rico manager Edwyn Rodriguez. Puerto Rico actually failed to score in their first at bat. Pagan led off with a base hit and reached second when Falu grounded out on a swinging bunt to the mound. 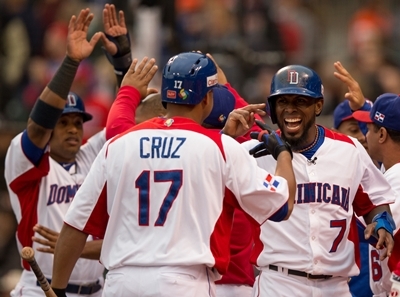 But Dominican starter Samuel Deduno came back to strike out Carlos Beltran and Yadier Molina. "Had we scored, we may have looked at another ball game" said Rodriguez. In the fifth inning, under a light rain, the game went through another turning point. Deduno walked a couple of hitters and manager Tony Pena made the trip to the mound. "Samuel actually told me that he didn't want to leave" disclosed Pena at the end of the game "That he wanted that hitter. So, I gave him that hitter". The hitter was superstar Angel Pagan and Deduno struck him out to end the inning and exploded with joy. In the bottom half of the frame the Dominicans made it 3-0 on reliever Hiram Burgos when a double by designated hitter Erick Aybar scored center fielder Alejandro De Aza from second. De Aza could have been easily forced out moments before, when he stood in front of second baseman Falu, who had just scooped a grounder by Reyes. With a three-run lead the Dominican Republic went to their magnificent bullpen. Octavio Dotel pitched the sixth and went into trouble (base hit by Aviles, a walk to Rios) in the seventh. But Pedro Strop dominated Rivera and pinch hitter Valdes throwing 95 mile per hour two-seamers with wicked tails. Casilla pitched the eighth, walking lead off hitter Pagan, who did not go beyond second base anyway. Fernando Rodney, who had already collected six saves in the tournament, took the mound for the ninth. He did not get scared by a lead off fielding error by Tejada (who had replaced at third injured starter Hanley Ramirez), got the first out on a pop to second and picked a couple of strikeouts, mixing his very effective 82 mile per hour changeup with a few 96 mile per hour fastball. "It goes back to the plantain. The Dominican Republic is the place were we eat the most plantains and produce the most baseball players" joked Rodney. Then, on a more serious note he added: "This trophy is the greatest gift we could give to our country". On a final note, manager Tony Pena said: "I told these guys from the beginning that they had to enjoy every minute. This group may never come together again. To go back to our President, during his campaign he said that he wanted to do something that had never been done before. Winning undefeated the World Baseball Classic had never been done before".